The video of the interview, published on Thursday, was viewed 30 million times in the first 24 hours after its release, giving it the highest first-day viewership in Funny or Die history, according to the Hollywood Reporter. That’s way more views than Galifianakis’ last interviewee/victim, Brad Pitt, who is having a decidedly worse week than Clinton. The premise of the show: Galifianakis makes fun of you and in return, if you play your cards right, you come off as a person who can take a joke. 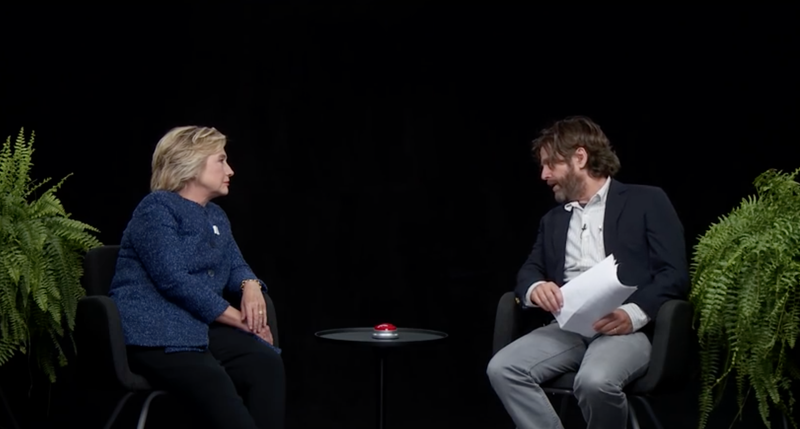 This is not typically thought of as Clinton’s strong suit, however she responded like a seasoned ironist to Galifianakis’ lobs on the Trans-Pacific Partnership, debate attire, and the possibility of civil war should Donald Trump be elected. Haha, rich, yes, Donald Trump is beloved by white supremacists. I only regret that Bernie Sanders never got his moment in the “Two Ferns” hot seat too, for he is on auto-deadpan, or, one might say, he knows not of humor and wanting to be liked, and that’s impossible to fake.